Atcom Services Inc. D/B/A LANshack.com, an industry leader in the Datacom Industry, is pleased to announce that we have earned ISO 9001:2015 certification. The comprehensive system audited and covered every aspect of our operations to ensure we maintain and implemenent a robust Quality Management System. Fulfilling the strict requirements of the ISO 9001 standard highlights our focus and commitment to deliver total customer satisfaction. ISO 9001 is a quality management system standard that was developed by the International Organization for Standardization, which is an association of governmental and nongovernmental organizations from many countries. The ISO 9001 standard is utilized to certify quality management systems that focus on continuous improvement, customer satisfaction and the active involvement of both management and employees in a process based approach. Any company that has been through the certification process knows that achieving ISO 9001 certification is demanding. Each individual in our operations must be wholly dedicated to the pursuit of quality. By scrutinizing our enterprise at every level, we assure that our customers are receiving superior customer service and the highest quality products. Here at LANshack, we have been serving high-profile clients for more than two decades, delivering bleeding-edge networking products and services capable of supporting digital operational workflows of all sizes. However, it all really started back in 1991 with the creation of Atcom Services Incorporated, LANshack's parent company. The business ascended to the top of the emergent networking industry at an accelerated pace, developing and deploying scalable cabling techniques that would form the basis for enterprise connectivity best practices. Within three years, the organization boasted an impressive client list featuring multiple Fortune 500 firms. In 1994, Atcom launched its manufacturing and distribution division. 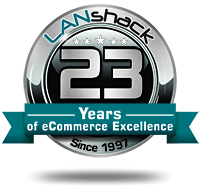 And, one year later, it debuted LANshack.com, the networking sector's first e-commerce portal. LANshack has continued to grow year after year, and has become an industry leader in Pre-Terminated Fiber Optic solutions, while providing products and support to Prime Vendors, Government, schools, and contractors. These partnerships have allowed us to perfect our products and services, and, more importantly, explore new networking methods. It is this forward-looking operational methodology that separates us from competitors and enables us to maintain our status as an industry innovator. Is your organization interested in bolstering its networking capabilities by partnering with LANshack? Connect with us today to learn more about our offerings and how we've been helping enterprises stay connected for more than 20 years.